It is downright stunning when a young couples taste seeps through each and every detail of their Indian wedding. Ayesha and Taran were one couple who got that just right! A wedding celebration that kicked off with a spunky pool party held at Kino Cottage, Mumbai and continued on to an elegant wedding reception held at Sun-n-Sand, Juhu. This Mangalorean + Punjabi with a mehndi and sangeet at Kino Cottage, Mumbai wedding was filled with prettiness, loads of cool and a stylish-chic bride and groom. Every choice Ayesha and Taran made, with their pre-wedding ceremonies, wedding outfits, décor details etc., each element picked was classy yet spoke of the young, vibrant personalities that they have. All these brill details along with the entire vibe of their wedding, the warmth of Kino cottage, Mumbai and the funky road wedding photoshoot only spelled out awesomeness in every aspect! A charming and off-beat venue like Kino Cottage was perfect for this modern-chic couple’s sangeet ceremony. The pebbled pathways, wood and stone-carved benches fairy lights all around created a beautiful atmosphere for Ayesha and Taran’s super fun sangeet ceremony. A marigold laden cycle and loud dhola walas were all that was needed to make their sangeet a truly Indian wedding affair. Dressed in a two-toned orange and yellow lehenga with gorgeous accents of pink, Ayesha looked absolutely stunning. To complement this fully desi attire of hers, Taran put on a sharp black sherwani with a perfectly made man-bun – is there anything to not like about this groom? The Wedding Fotografos took Ayesha and Taran’s wedding a level up with their pure Mumbai street style wedding photoshoot. Once the Gurdwara wedding was done, Ayesha and Taran took to the streets of Mumbai to create some amazing memories. 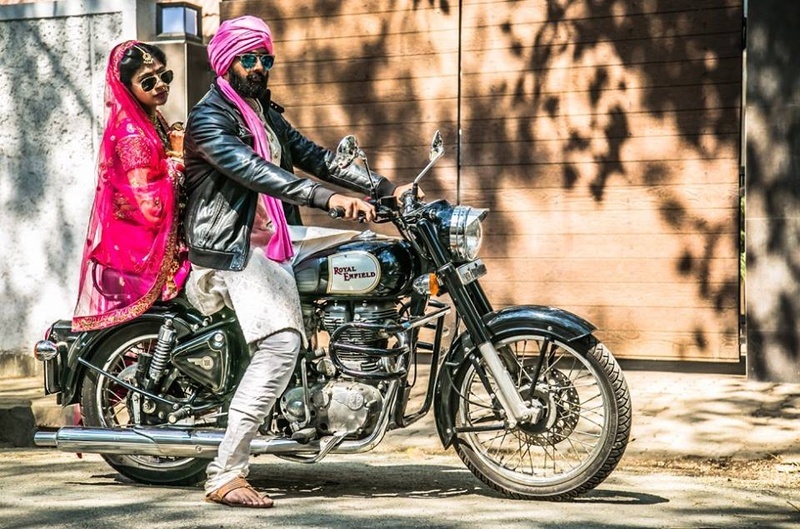 Rickshaws as props, funky reflectors, riding on a Harley Davidson in traditional bride and groom attire – this fresh, mod pre-wedding shoot idea was new, young and preppy – and we loved it!